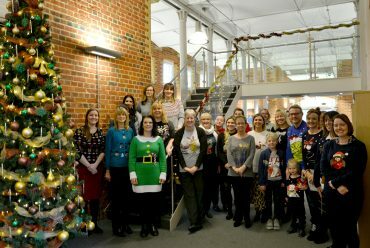 This year TSP decided to once again join in with the festive fun and support Save the Children’s Christmas Jumper day campaign on Friday (21st December). The national campaign was held on Friday 14th December but as this coincided with the firm’s Christmas party we decided to hold it on our last day in the office before Christmas! The idea was that people would support the fundraising effort by wearing their best/worst Christmas jumper and contribute a £2 donation for the privilege of looking so festive. The firm also provided a selection of festive food and drink in exchange for a donation along with a Christmas Hamper raffle and ‘Guess the number of Sweets’game. The day was a great success with some excellent Christmas jumpers on show. We have raised a fantastic total of £228.10 for Save the Children! You can find out more about Save the Children’s campaign and the projects they support here.